Vegetable lasagnas promise a colorful, flavorful comfort food in a healthier package, but they almost never deliver. While you could argue that the healthfulness of a veggie lasagna makes up for it’s flavor shortcomings, that still doesn’t change the fact that they are often watery and bland. Since they have no cheese or bechamel sauce to balance them out, they also tend to be one dimensionally acidic. At best they taste a bit like a baked ratatouille, but they’re a far cry from the rich comfort food we all know as lasagna. Certain there’s a better way, I set out to make a vegetable lasagna that’s still able to comfort you on dismal days yet one that won’t leave you with a hangover of guilt. The first problem with most vegetable lasagnas is that that they use raw vegetables. There’s a two-fold problem with this. The first is that raw vegetables tend to give off a lot of water as they cook, making the lasagna watery. The second problem is that most vegetables need to be browned in order for them to reach their full flavor potential. Since cooking them in the sauce essentially boils them, they don’t have a chance to brown. To get around this, I roast the vegetables first. 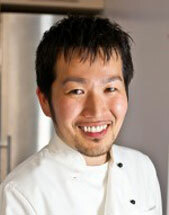 This creates sweetness and umami in the vegetables, while reducing their water content. The second problem with vegetable lasagnas is that the sauce often falls woefully short on flavor. 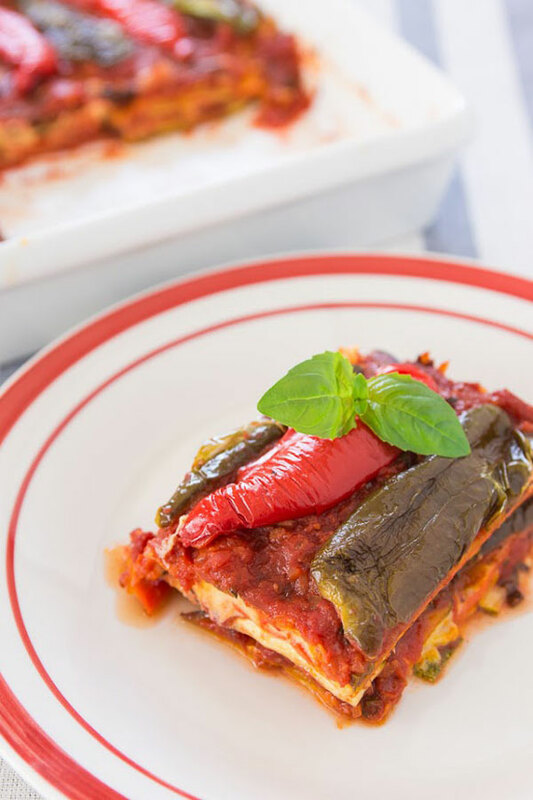 While the addition of meat and cheese can lend enough umami to a bland sauce to make it palatable, you need a robust and balanced tomato sauce if you want a delicious vegetable lasagna. The solution here is to make a better tomato sauce. That’s beyond the scope of this post, but check out my basic tomato sauce recipe for my tips on making an amazing sauce. While using a great tomato sauce goes a long way in making a more flavorful lasagna, it doesn’t make up for the lack of dairy in a vegan lasagna. That’s why I created a vegan bechamel sauce made from raw cashew nuts. It’s mildly sweet, luxuriously creamy and with the help of a little nutritional yeast, it tastes like rich cheesy bechamel. This is where I have to make a confession… I was hungry, and this sauce was so good, I ate three large spoonfuls of sauce and licked the bowl clean. Seriously, I may never make a normal bechamel again! For the vegetables, I used some zucchini, carrots, kabocha, and red and green bell peppers because of their balance of flavor, sweetness, color and texture. That said, you could really use just about any combination of flavorful vegetables that can be sliced into sheets. Potatoes, beets, rutabagas, eggplant, and other types of squash would all be excellent options. The resulting lasagna was not only a real head-turner, it tasted amazing! With all the right textures and flavors that a really great lasagna has. With alternating layers of sweet roasted vegetables and tart tomato sauce sandwiching a rich and creamy cashew bechamel sauce, the contrast of colors, flavors and textures makes this delicious by any standard. In fact, I’d even go so far as to say that this is one of the five best things I’ve made this year. 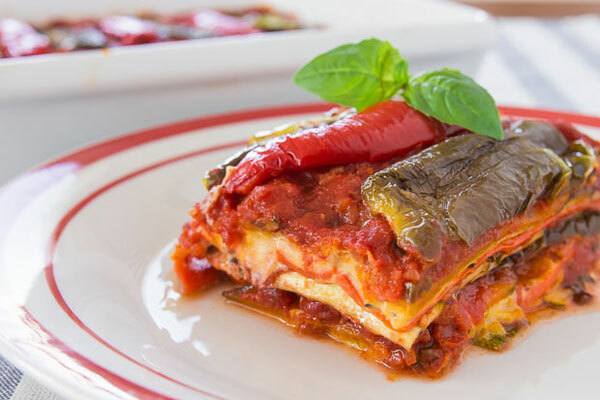 This vegetable lasagna recipe features roasted vegetables, a rich tomato sauce, and a unique bechamel sauce. The day before you plan to make this, put the cashew nuts in a bowl and cover with water until completely submerged. Soak in the refrigerator overnight. The next day, drain the cashews reserving the soaking liquid and add the nuts to a blender or food processor along with 1/4 cup of the soaking liquid. Puree the nuts adding more soaking liquid a tablespoon at a time until you have a smooth bechamel about the consistency of custard (should be easily spreadable, but not runny). Add the nutritional yeast, nutmeg and salt and process until smooth. Use a mandoline or sharp knife to slice the zucchini, carrot and kabocha about 1/8" thick. Remove the stem, seeds, and membranes from the bell peppers and cut them into segments. 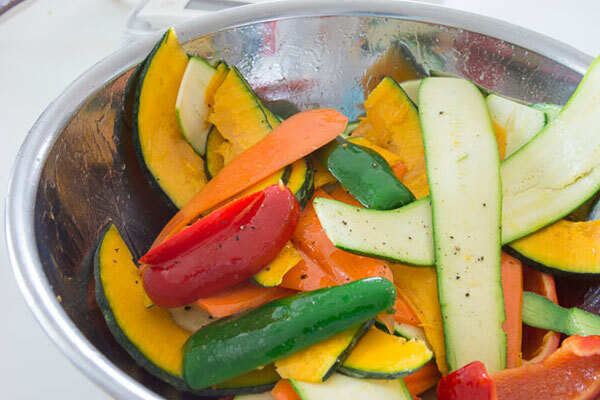 Toss the vegetables with the olive oil, salt and pepper to coat evenly. 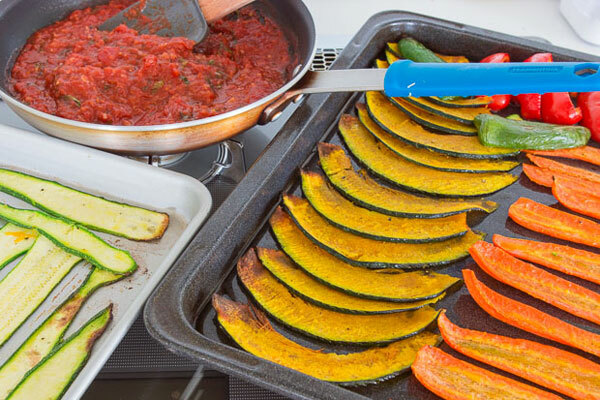 And then spread the vegetables out on baking sheets in a single layer (you'll probably need 4 sheets). Roast the vegetables until they're cooked through and just starting to brown (about 10-15 minutes). To assemble the lasagna, spread a layer of tomato sauce on the bottom of a 10-inch square casserole dish. Start with a layer of tomato sauce and then a layer of a firm vegetable such as carrot or zucchini, this makes it easier to serve. Continue alternating vegetables and tomato sauce, adding 2 layers of bechamel sauce at the 3rd layer of vegetables and the 6th. Finish with a layer of bell peppers. Bake the lasagna until the sauce is bubbly and the lasagna has set (about 20-30 minutes).